Can DNA tell me my mutt’s ancestral breeds? My lovely dog Kyndra is NOT a labrador retriever! I was so sure she was some sort of lab/border collie mix. She is very loving, playful, smart, and even likes to swim. 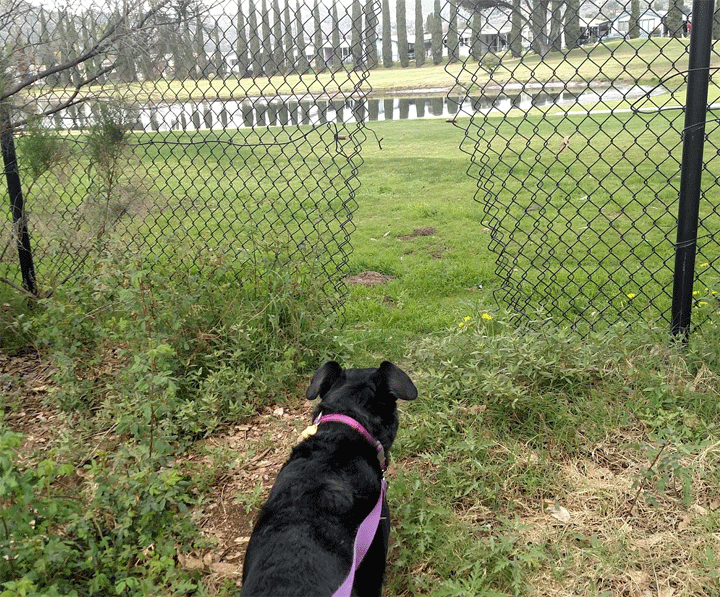 I can no longer let her off leash on the local river trail because there is a hole in the fence to the golf course and twice she has treated the water hazard there as her very own swimming hole! How can she not be a lab? 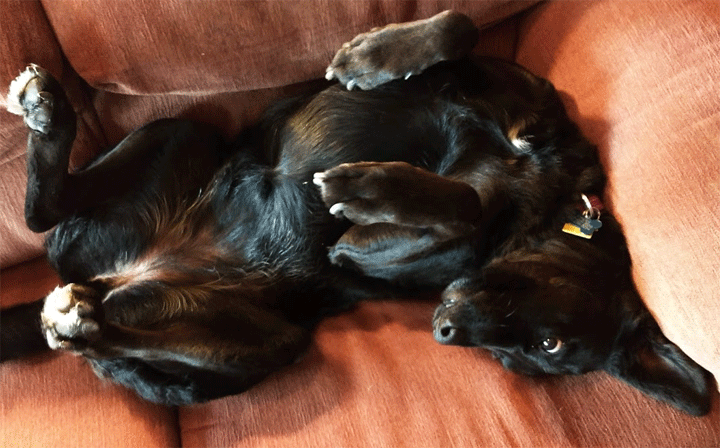 Smaller than a lab at 52 pounds but about the size of a border collie with the short glossy black hair of a lab, the face shape of a collie, and the flag-like upcurling tail of a shepherd. Her eyes are so dark that they look black. Searching online, I find many sites which discuss the lab/border collie mix. 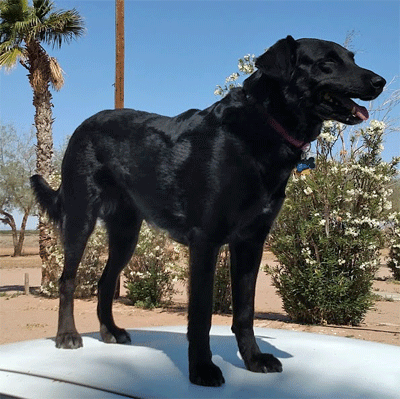 I think this “borador” description is a very accurate description of her personality: http://www.spockthedog.com/mixed/borador/ plus the pictures of boradors look just like her with just a bit more hair. “Most often the body of a Borador has the build of the Collie and the colors of a Retriever,” as that site says and as she does to my eyes. 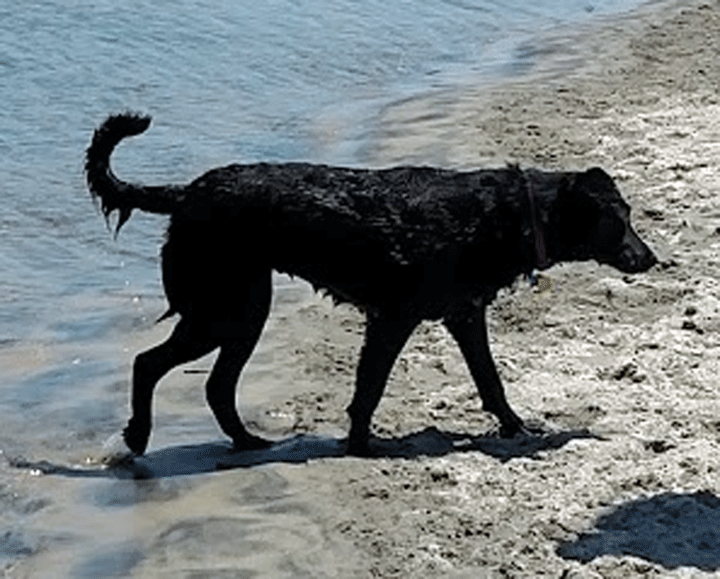 The idea of DNA testing your mutt is to know what breeds she is descended from. That way you know what health issues to watch out for. To be honest, it was really just to satisfy my curiosity. My husband did not see why we should do this, so I put the Wisdom Panel 3.0 Breed Identification DNA Test Kit on my Amazon wish list and I was delighted when a grateful reader got it for me! Thank you Pauline! However DNA results show no lab at all! At least they include 25% border collie. The other breeds are hard to see in her. German Shepard tail? Bulldog body shape? Rottweiler eyes? Hair growing backwards on her spine from the Airedale? Maybe the answer is that she is just so many generations from any known breeds that it is hard to be accurate. She is a rehome from Jamul (not far from the Mexican border) born to the neighbor’s black dog, father unknown. Or perhaps the breed composition has the same basic built in inaccuracies as the DNA ethnicity tests for people: just not a big enough database to draw from yet. Sadly the wisdom panel results do not include a download of the raw data. I decided to research the history of dog breeds some more. From the wikipedia article on the domestication of dogs we learn that the various European domestic dogs are known to be descended from the gray wolf of Eurasia and North America. That same article points out that the archaeological record and genetic analysis show that the first undisputed dog was buried beside humans 14,200 years ago with with disputed remains occurring 36,000 years ago. Wikipedia has a good article about dog breeding where we learn that humans have bred dogs for thousands of years to herd, guard, and hunt but it was the Victorians who created many of the modern showy breeds less than 200 years ago. 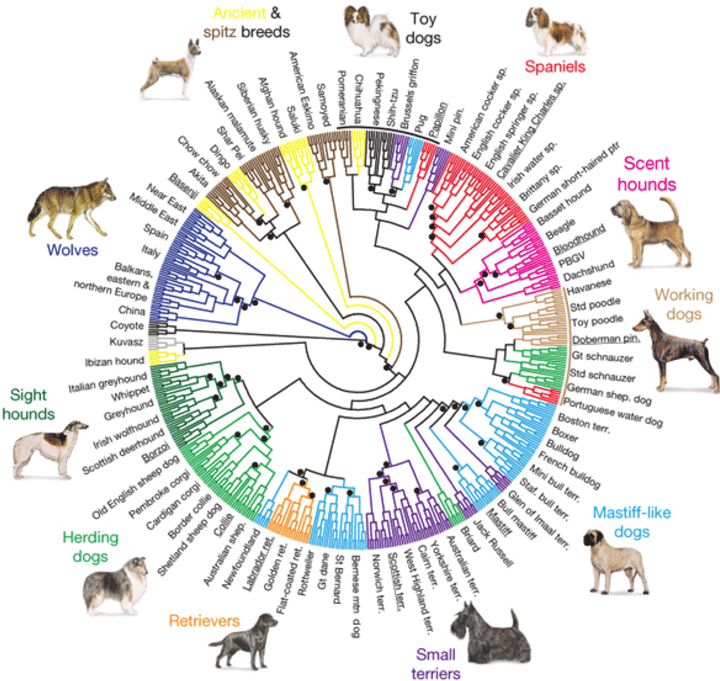 The NIH has an ongoing study of dog breeds which includes this well done wheel of dogs by DNA. What does your mutt look like? Your mutt looks most like a German Shorthaired Pointer with a score of 21. Your mutt looks somewhat like a Akita with a score of 16. Your mutt looks somewhat like a Chow Chow with a score of 15. Your mutt looks somewhat like a Collie with a score of 11. Your mutt looks somewhat like a Rottweiler with a score of 10. Your mutt looks somewhat like a Golden Retriever with a score of 7. Your mutt looks somewhat like a Basset Hound with a score of 5. Your mutt looks somewhat like a Shetland Sheepdog with a score of 5. Your mutt looks somewhat like a Standard Poodle with a score of 3. 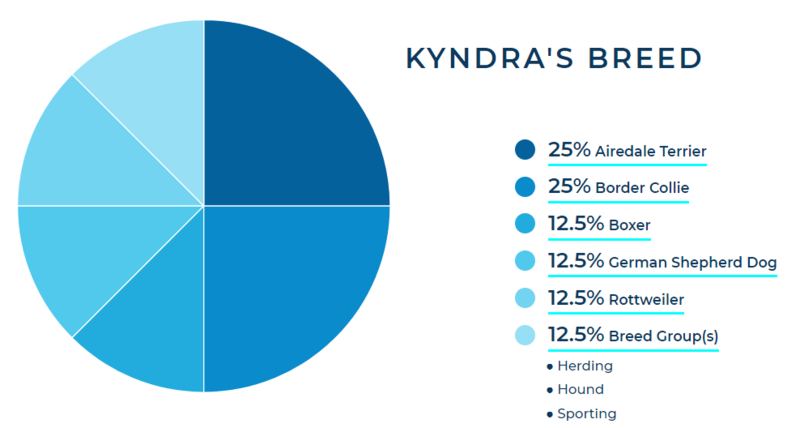 Whatever her ancestors were, our sweet Kyndra brings us much joy. Her only flaw, aside from the occasional chewing up of a shoe or book, is that she loves children more than other dogs! ← MTHFR – hype or a problem? Whatever she is, she is a beauty! Thanks Nancy! She brings us great joy and the research for this post was fun too as well as an excuse to post lots of pictures of her! Great post. My dog looks like yours but I was told he is part Shepard and part lab. He’s protector, he doesn’t care for loud noises, but he’s a runner. I must take him outside on leash. 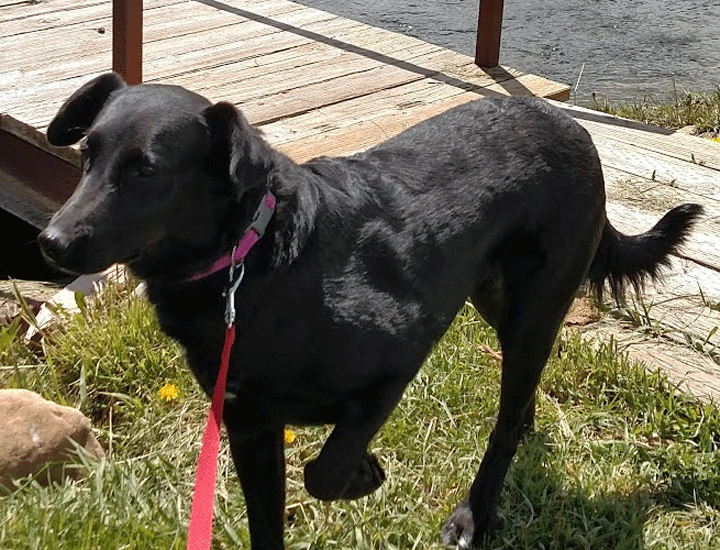 Our darling loves to run too but is good about staying on the property when we take her out to get the paper or mail … but you should have seen her run up and down that golf course after her swim! Love it, I had my dogs DNA done as well, as we got her from a Shelter when she was 11 months old. She is mostly Australian Kelpie.